Tori Morrison (7) advances the ball up the field for Miami Trace during a Division II Sectional championship game against Circleville Saturday, Oct. 20, 2018 at Miami Trace High School. 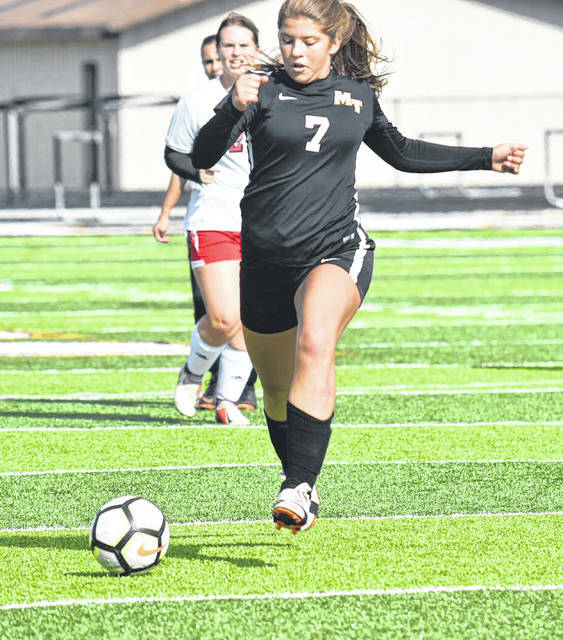 The Miami Trace girls soccer team was vying for its first Sectional championship in school history when they hosted the team from Circleville on Saturday, Oct. 20. Earlier in the season, Miami Trace had defeated the Lady Tigers, 2-1. On Saturday, Circleville was able to shut out Miami Trace, 1-0. The game was scoreless at halftime and remained so until there was 13:23 left in the game when Circleville scored. “We controlled a large portion of the game,” Miami Trace head coach Caitlin Francis said. Miami Trace outshot Circleville, 19-7. “However, they were able to finish today and we could not,” Francis said. Khenadi Grubb had five saves in goal for Miami Trace. Circleville will play Fairfield Union in the District semifinals Thursday at Logan High School. In the other semifinal Thursday, Unioto takes on Waverly. “It was a very disappointing end to a largely successful season for our program,” Francis said. Miami Trace ended the season 11-5-2 marking the best record in school history for the girls soccer program. “Our 10 seniors played a huge role in making the season a memorable one and they will be greatly missed,” Francis said. The seniors are: Tori Morrison, Cassie Baird, Macy Creamer, Natalee Payton, Krissy Ison, Khenadi Grubb, Lena Steele, Cassidy Lovett, Becca Ratliff and Tori Evans.